This shows half of the hot cross buns with fruit and half without. 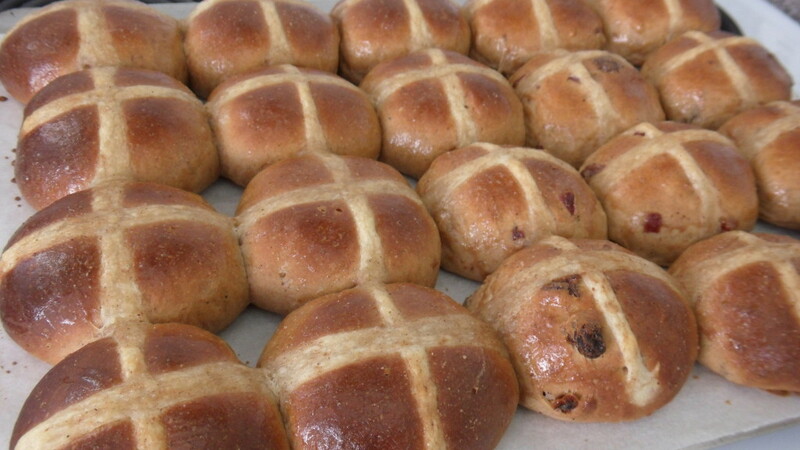 Hot cross buns at Easter are a must, and this is a lovely hot cross bun recipe. Mum has been using this recipe since the 1980s, when it appeared in an issue of New Zealand More magazine. 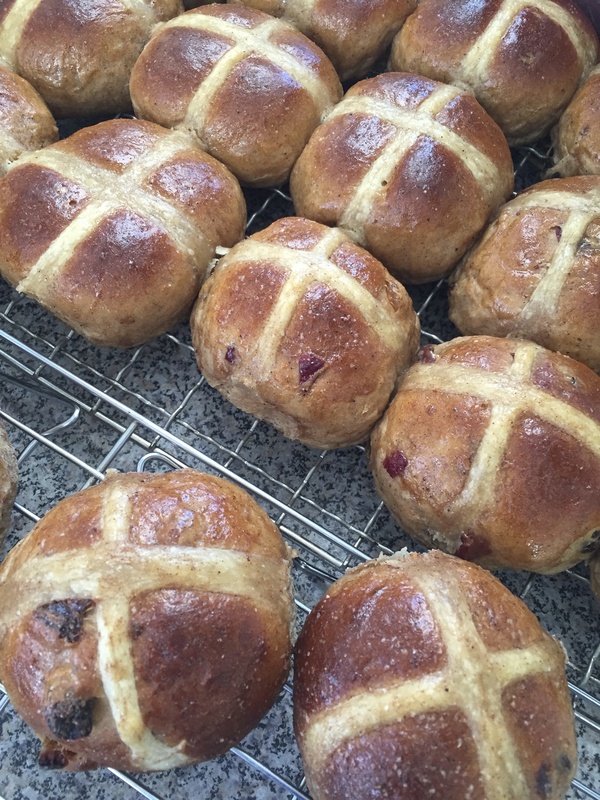 Mum and I differ on the issue of fruit in Hot Cross Buns – she likes the addition of fruit, and I detest it (with a passion!) 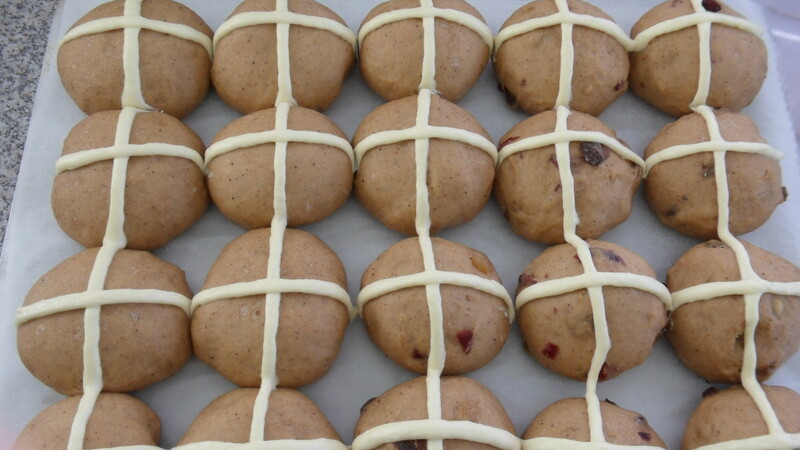 So the following recipe is for the option of making the Hot Cross Buns all-with-fruit or all-without-fruit, or half-and-half, and this last option is what we do to get around the problem and to make everyone happy. We make the dough, then halve it after the first rising and knead the fruit into one half of the dough only, so I get 12 fruitless buns, and Mum gets 12 with fruit. Problem solved, and it’s not complicated at all. Mum also adds ¼ cup of dried cranberries to make up her 1 cup of fruit (pour boiling water over the dried cranberries and leave to soften for 3 minutes. Drain off the water and dry cranberries on a paper towel, then dust with a small amount of flour to separate them so they mix in better). You can do this to any fruit used in this recipe that looks a bit dry. Note: If making half the dough without fruit, reduce the amount of fruit to 1 cup. Heat the milk and 2 tablespoons of the brown sugar to lukewarm, stirring constantly to dissolve the sugar. 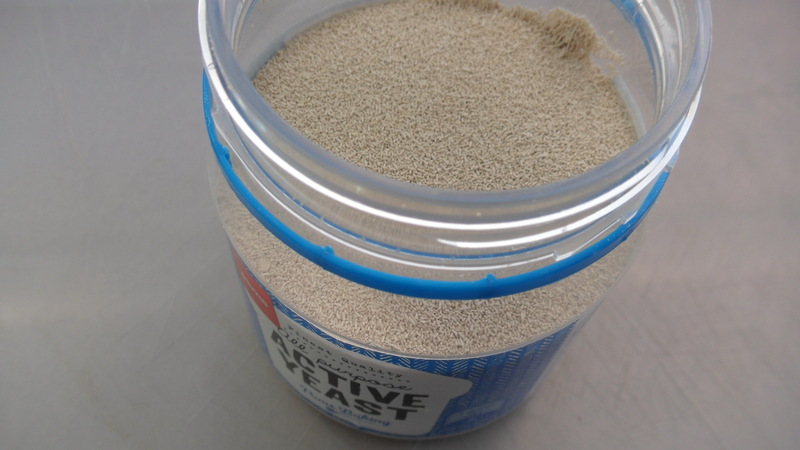 Remove from the heat and sprinkle the yeast on top then allow to stand for 10-15 minutes, until the mixture froths. In a bowl place the flour, remaining brown sugar, salt, cinnamon, mixed spice, cloves, nutmeg, fruit mix, and sultanas. Mix together and make a “well” in the centre. Pour the melted butter, eggs, and yeast mixture into the “well” and mix all ingredients together. Transfer dough to a large greased bowl, cover with a damp cloth and put in a warm place (in the sun or hot-water cupboard) until dough has doubled in bulk – approximately 45-60 minutes. While waiting, make mixture for the glaze. Combine ingredients, heat slightly and stir to dissolve sugar. Knock the dough down and turn on to a floured surface. (OPTIONAL: if making half with fruit and half without, split the dough in half now, and add 1 cup of fruit to one half only.) Knead the dough with the heel of the hands for 10-15 minutes, or until dough springs back when gently pressed with a finger (add extra flour to prevent sticking during kneading). 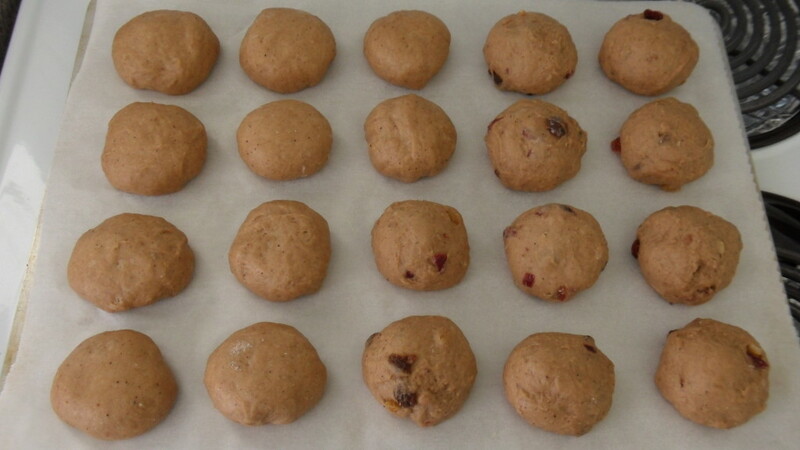 Shape into 24 buns and set reasonably close together on a lightly greased oven tray. Return to warm place for another 30-45 minutes, or until double in bulk. While waiting, make the mixture for the crosses. Stir the butter into the flour, add the water and whisk to a smooth consistency, then spoon into a piping bag, or spoon into the corner of a plastic bag, and cut the corner off. Put aside at room temperature. Bake at 215 degrees Celsius for about 7 minutes. Brush the buns with the glaze and bake for a further 3-5 minutes, or until golden. Serve hot, spread with butter. Also in the above post is a tasty recipe for a spiced honey butter to spread on the Hot Cross Buns.